Why is it that so many “hero” songs are sappy power ballads? Not that there’s anything wrong with that, per se, but a quick glance at Allmusic’s list of more than 169,000 “hero” songs reveals track after heroic track of hideous schlock, including quite a few Christian rock ballads. Thankfully, buried in all that pap is Tina Turner’s “We Don’t Need Another Hero,” a song that starts out slow enough but gradually builds to a soaring and anthemic chorus. 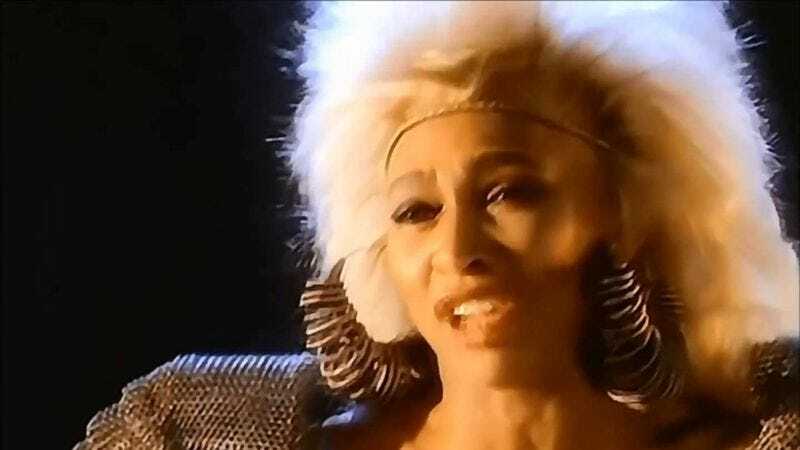 A track that popped up on the Mad Max Beyond Thunderdome soundtrack and comes complete with a movie-appropriate music video, “Hero” quickly became one of Turner’s biggest singles ever, and it’s easy to see why. Turner’s hair might look absolutely hideous in the clip (and the movie, where she plays Aunty Entity, the corrupt ruler of Bartertown), but her voice is majestic, growling toward notes and tones that only she can really deliver. “We Don’t Need Another Hero” might be 30 years old, but like Turner herself, it hasn’t aged a bit.